How do you use the EpiPen? 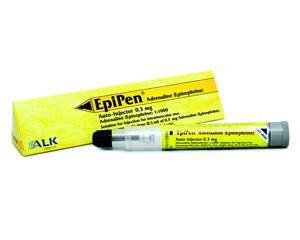 The EpiPen Auto-Injector is a syringe that is filled with adrenaline (also called epinephrine). Adrenaline is a hormone that constricts blood vessels and dilates the respiratory tract. Symptoms due to a severe allergic reaction may be (temporarily) lifted this way. The EpiPen Auto-Injector is an emergency medication used in case of acute and severe allergic reactions. This may be triggered by eating certain foods for example, or insect bites / stings, or a certain medication. During a severe allergy attack, the body may respond to these incentives so strongly that a so-called anaphylactic shock occurs. Symptoms include shortness of breath, chest tightness, severe rash, gastrointestinal symptoms, swelling of tongue, difficulty swallowing, heart problems and fainting. By directly administering adrenaline with the EpiPen Auto-Injector these symptoms are (temporarily) combated. Alternatively, the injection can be administered through clothing. After use you can discard the syringe (with safety cap). Consult the leaflet for complete information about the use of the EpiPen Auto-Injector. Note: The EpiPen Auto-Injector should be administered as soon as possible with a severe allergic reaction. If you suffer from severe allergies, you should always have the EpiPen Auto-Injector handy. The adrenaline in the EpiPen only works temporary, once it wears off the symptoms may return. Therefore always consult your physician after administering this medication, so the allergic reaction can be treated further. The EpiPen Auto-Injector contains 0.3 mg of adrenaline (epinephrine) and is suitable for a single use in adults or children with a body weight from 66 pounds. Side effects may occur when using the EpiPen Auto-Injector. Rarely heart problems occur (palpitations, chest pain). Other side effects include trembling hands, headache and dizziness. In the leaflet you can read all about any contraindications, warnings and side effects. You can use the EpiPen Auto-Injector without any issues if you are pregnant or breastfeeding.